It's a telling reflection of Port Melbourne's racial divesity, that if you see a turban on Bay Street ... it's almost certainly worn by Mankanwar Singh, one half of the couple that owns Port Melbourne's oasis of spice, in a town dominated by mozarella. 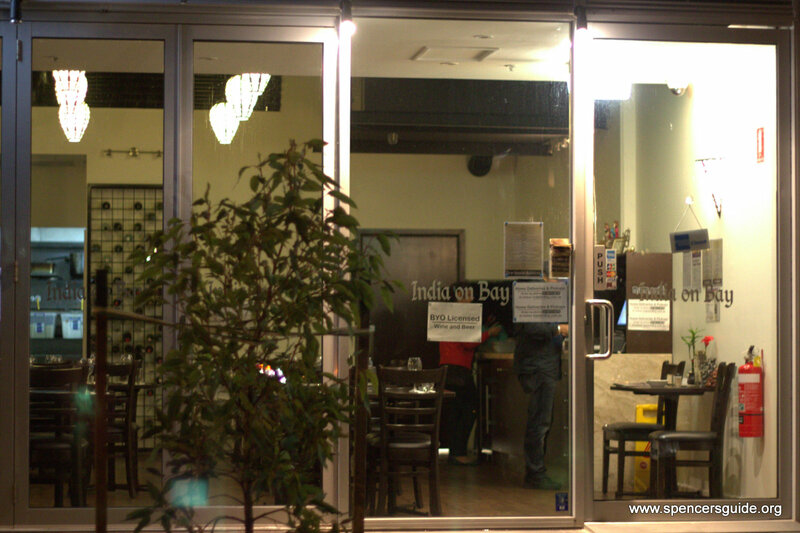 India on Bay (on Rouse) has been open for a full six months but is not yet always busy. Mankanwar is keen to suggest that it's ambience that people are looking for in a good restaurant, which probably explains the new feature wall in what was, a glass-fronted white box. Despite this new texture, I can't help feeling that this place would still benefit from some curios, fabrics or vegetation, to break up the space a bit, and perhaps to remind guests of the region of the world that is inspiring the, generally tasty, food. The previously compact menu has recently been supplemented with some specials, but the pizza naan is wrong on many levels (although perhaps retaliation for La'Vero starting to offer a few Indian dishes?). Surprisingly the restaurant is still sporting BYO only signs on the windows which, with IGA just round the corner, is potentially a real money saver, but may be deterring finer diners.